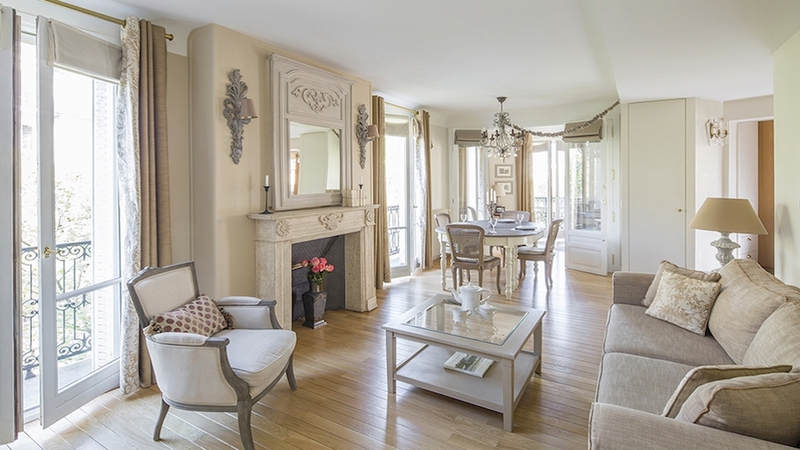 New to the Paris vacation rental experience or have questions about reserving a rental with us? Read our Terms and Conditions for an overview of planning your vacation with Paris Perfect. The following terms and conditions delineate the contract between You and our Tour Operator Company which permits you to occupy the property for the dates shown in your confirmation invoice email, called either “Deposit Payment Receipt and Information for Planning Your Trip to Paris” or “Paris Perfect Final Payment Receipt”. The remaining 50% is due 90 days before arrival. You will receive a payment reminder email 10 days before the final 50% payment is due. We provide a 5-day grace period for the final payment. Failure to pay the final balance due by the end of the 5-day grace period is considered a cancellation with no refund due. Failure to pay the final balance due is considered a cancellation with no refund due. We provide a 5-day grace period for the final 50% payment, after that the reservation is cancelled with no refund due. Your rental is not confirmed until you accept the terms and conditions, and your card has been charged or your wire payment has been received. Once you have paid the deposit, a contract will exist between You and our Tour Operator Company. The rental contract cannot be assigned to a third party. Making your reservation by telephone, on the website, or by email, means you are deemed to have read and accepted these terms and conditions and the general information pages contained on our website. On receipt of the initial payment, we will confirm your reservation and send a link to download our popular Paris Guide and Vital Property Information. Prices fluctuate throughout the year. Once your booking is confirmed your rental price is protected and will not be changed. It is your responsibility to ensure that all members of your party, including any children, have a valid passport and visa (where appropriate). Passports must be valid for a minimum of six months after your departure date. The official check-in time is 3.30 pm. However we know what it's like to arrive in Paris after an all-night flight so we try to be as accommodating as possible. If the property is ready, your greeter will meet you there. If the property is not ready before 3:30 pm we will let you know about luggage storage arrangements. You must provide your arrival details in advance in order to schedule your check in appointment. You also need to call from the airport after collecting your luggage, or from the train station, to confirm that you are on your way before the greeter will go to the property to await your arrival. The cleaners need sufficient time to prepare the property; we cannot promise that the property will be ready prior to the 3:30 pm unless you book the night before for guaranteed check in from as early as 9:00 am. Arrivals after 7:00 pm must be arranged in advance and are subject to a €75 late arrival fee charged to your credit card. Staff is not available to greet guests after 10.00 pm. The check-out time is 10:00 am. If you need to store your luggage past this time please arrange in advance with the greeter. We pride ourselves on offering fine properties with nice furnishings, antiques, fine linens and top-of-the-line appliances. We want you to feel at home and enjoy every moment of your stay without worrying about any "What ifs?" should something happen. Because accidents happen, our goal is to ease your mind by minimizing your costs if they do. In order to make your stay as worry-free as possible all guests are required to purchase a non-refundable Accidental Damage Waiver that covers you for accidental damage and/or breakage up to 1,500 USD per stay. The damage waiver price is €49 Euros for properties with a nightly rate up to €300 Euros and €59 Euros for all other properties for stays up to 28 nights. Stays longer than 28 nights pay an extended damage waiver of €49 Euros for properties up to €300/night or €59 Euros for all other properties for each additional 28 nights or portion thereof. Cost to repair electrical appliances broken to carelessness. Please note: The non-refundable waiver does not negate your responsibility to be respectful of owner's property and to leave it neat and tidy on departure. To avoid erroneous blame, guests must notify their greeter by email or telephone if anything is amiss when you arrive at the property. Damage not reported, or that are the result of negligence/intentional acts, are not covered under this plan. If there are costs or damage greater than the Accidental Damage Waiver coverage, they will be deducted from your Key & Cleaning deposit. Please keep a close eye on the keys to the property so that you don’t lose them! Replacing keys and locks is very expensive in Paris. Many properties have special building keys and complex security locks that must be replaced for insurance purposes when keys are lost. To cover the costs of key replacement, you will be charged by the onsite contractor’s manager a refundable Key & Cleaning Deposit. This Deposit also covers some costs not covered by the Accidental Damage Waiver. Collection of the Key & Cleaning Deposit varies depending on the property you have reserved. For the majority of the properties, your greeter will swipe your credit card to obtain a “pending” transaction. The amount is in the range of €300 but varies by property; please refer to your booking confirmation email for further information. After you depart, the property will be checked to confirm it was left tidy, no malicious damage or loss of items such as keys. If all is well, your card will not be charged. In the unlikely event of loss, malicious damage or extraordinary cleaning, your card will be charged for the amount to cover the costs. for some properties, we require that you authorize the €300 Key & Cleaning Deposit prior to making final payment for your accommodation. As above, your property will be checked upon departure to confirm it was left tidy and with no loss of items such as keys. If all is well, your card deposit will not be charged. In the unlikely event of loss, damage or extraordinary cleaning, your card will be charged for the amount to cover the costs. We strongly encourage you to take out travel insurance in the event that you must cancel your trip, or have problems while travelling. We can refer you to a reputable travel insurance company Travelex, they offer a comprehensive travel insurance that covers most eventualities. Important: In the event that you decide not to take out Travel Insurance you agree to indemnify us against any charges that might otherwise be covered by your insurance. You further agree that we are not responsible for any costs of cancellation by you. Flight monitoring and help: We recommend the Cranky Concierge to monitor your flights and provide emergency assistance if your travel is delayed or cancelled. Cancelling more than 60 days before arrival date: Payments made are fully refundable, minus $250 USD administration fee and applicable fee charged by bank to process the refund. Cancelling 60 days or less prior to arrival date: Rent payment is non-refundable. If the only property available is of lesser value, you will be refunded the difference as soon as possible. If you decide not to occupy the alternative property, a 100% refund will be provided. If you decide to stay in the alternative property, this indicates full acceptance of our offer. If we have no availability in the properties we represent, we will refund your payments immediately and do our best to help you find another one. We do our best to notify guests about construction work in the lobby or common parts of a building, but, unfortunately, we are not always informed ahead of time and cannot be held responsible for building work beyond our control. The properties are remodeled with care and quality furnishings. Thank you for treating the property as if it were your own home. The property will be clean when you arrive and you are expected to leave the property in a tidy condition when you leave. This includes disposing of trash and doing the dishes. We thank you in advance for this courtesy. If upon arrival you spot an issue of cleanliness or damage, please inform your greeter immediately so they can take care of the situation. For stays of 2 weeks or longer, cleaning will take place weekly after one week. You agree that you will not use the property for any dangerous, offensive, noisy, illegal or immoral activities or conduct any act that might be a nuisance or annoyance to your neighbors. You will be responsible for all payments and for any malicious damage whether caused by you or a member of your party and shall make your party fully aware of these Terms and Conditions. Instructions specific to the Property will be discussed with you at the time of arrival. It is your responsibility to supervise your children. Please ensure they do not cause any damage and respect the peace and quiet of the building. These are old buildings and noise can reverberate. Do not allow children to play loud games in the property or to yell, especially at night or early in the morning, or play in the stairwell or elevator. Some of the properties are not appropriate for children and have strict age restrictions. Any age restriction is stated in the property descriptions on the website. Please be aware that a disregard for age restrictions may result in refusal to check you into the property with no refund due or a requirement for an additional security deposit. Most of the properties offer free telephone calls to landlines and mobile phones in the United States and Canada (except Alaska). Free calls to landlines only in Europe, Australia, New Zealand and many other countries. Please refer to the "Overview" page of each property for more details. Wi-Fi is free of charge. If you require computer support, we can refer you to a tech specialist who can assist you at your own expense. Please refer to the "Overview" page of a particular property for Wi-Fi details. Many, but not all of the properties, have air conditioning. Paris city codes prohibit making alterations to the beautiful historic buildings where some of our properties are located. As a result, it is not permitted to install fixed air conditioners in most properties. Instead, fans or where possible, mobile cooling units are provided. The mobile cooling units are the most powerful units available, but please note they are less potent than full central air conditioning systems. They do provide sufficient cooling in most cases. Also note that these units must vent to the outside and are positioned at windows, which generally have a fitting to hold the extraction tube or may require opening the window. Some buildings restrict hours of operation due to noise regulations. Please alert the greeter of any problem as soon as it is identified and every effort will be used to rectify the problem as quickly as possible. If you do not informed of a problem, it cannot be resolved for you. Properties cannot be held responsible for breakdowns of mechanical equipment in common areas of the building or failure of public utilities; we will do our best to resolve problems as quickly as possible. Repairs to the common areas of apartment buildings such as stairwells, lobbies, roofs, elevators are ongoing and unpredictable. There is no requirement for notification of residents or neighbors of building works whether they occur in common areas of the building or in other apartments in the building. It is the same for street work such as plumbing line repairs or street repaving for which we receive no notification. Claims for cancellation for this reason will be rejected. Our contractors reserve right to enter the property at any reasonable time for reasonable cause. This includes the need to undertake unforeseen repairs. Authorized contractors may enter the property for repairs/cleanings as required. A reasonable notice of such requirements will be given to you and restricted to the hours of 9:00 am to 5:00 pm when reasonably possible, unless the urgency of the situation requires earlier or later entry. The number of people sleeping in the property must not exceed the maximum number of guests as stated on our website. If the number increases you must advise us in advance of your arrival. Children under age 24 months stay free of charge and are counted in the guest total. If you are traveling with infants or toddlers it must be stated at time of reserving. We are contractually bound to adhere to the occupation limits as set by property owners and/or in line with the legal limits imposed by the local authorities. Over occupancy can result in a request to evacuate the property immediately with no refund. We understand that you may wish to entertain while staying in your vacation rental. Should you wish to do so, please ask us for details of the maximum number of visitors. Should your party exceed this limit we would be pleased to recommend alternative venues. The properties are smoke and pet free, this includes balconies and terrace areas. The properties are equipped with safes to store your valuables. The greeter will explain how to dead bolt your front door, and lock windows when you arrive. It is your responsibility to make sure proper precaution is taken against theft and burglary including dead-bolting the door and latching all windows (or correctly latching the shutters) whenever you are out. You are liable for any costs associated with a failure to follow these requirements. If you leave items behind please contact us to arrange to have them returned, the shipping and an administrative fee will be charged to your credit card. Please make sure your personal or traveler’s insurance will cover you in the unfortunate event that you injure yourself in the property or if you become ill during your stay. In the unlikely event of theft or damage to person or personal belongings, fire, terrorist attack, civic unrest or other force majeure event neither the Tour Operator nor the property owner are responsible for direct or indirect harm suffered. In the event of any dispute, this Contract will be construed as a whole and interpreted in accordance with its fair meaning. This contract shall be governed by and construed in accordance with law of the Tour Operator domicile and will fall within the exclusive jurisdiction of the Tour Operator domicile courts. The clauses of this contract shall operate on the basis that the terms and conditions and provisions contained within them shall be severable so as to have effect as separate and distinct rights, provisions and obligations independently of the others. In all cases where any part of these terms and conditions is an unenforceable provision it shall not affect the validity of the remaining portion of these terms and conditions which remain in force. You agree that Tour Operator / Owner's liability for all claims, of any kind, arising out of this rental engagement shall be limited to the total fees paid by You on this engagement. In no event shall Tour Operator / Owner be liable for any special, indirect, punitive, incidental, exemplary or consequential damages, any damage that is not reasonably foreseeable or any damages whatsoever resulting from the cancellation of a reservation. Nothing in this clause shall be construed as excluding any liability which cannot be excluded or limited under the laws of Bermuda except in so far as it is competently varied or excluded and these conditions shall be read and construed accordingly. The Tour Operator Company does not own or operate any entity which is to or does provide goods or services for your stay, including, for example, arrangements for or ownership or control over houses, properties or other lodging facilities, greeters or property managers, airline, vessel, bus or other transportation companies, local ground operators, visa processing services, providers or organizers of optional excursions, food service or entertainment providers, etc. All such persons and entities are independent contractors. As a result, the Tour Operator is not liable for any negligent or willful act or failure to act of any such person or entity, or of any third party. Without limitation, the Tour Operator is not responsible for any injury, loss, or damage to person or property, death, delay or inconvenience in connection with the provision of any goods or services occasioned by or resulting from, but not limited to, acts of God, force majeure, acts of government, acts of war or civil unrest, insurrection or revolt, strikes or other labor activities, criminal, terrorist or threatened terrorist activities of any kind, overbooking or downgrading of accommodations, structural or other defective conditions in houses, properties or other lodging facilities (or in any heating, plumbing, electrical or structural problem therein), mechanical or other failure of airplanes or other means of transportation or for any failure of any transportation mechanism to arrive or depart timely or safely, dangers associated with or bites from animals, insects or pests, sanitation problems, food poisoning, epidemics or the threat thereof, disease, lack of access to or quality of medical care, difficulty in evacuation in case of a medical or other emergency, or for any other cause beyond the direct control of the Tour Operator. In addition, the Tour Operator is not responsible for its own negligence. Protecting the privacy of our clientele is an obligation that we take very seriously. We are committed to protecting all of your personal information.